If you like the idea of a control system for your home and would like to know more about what is available from Control4, then please read on . . . . . . . The heart of any Smart Home System will be the controller. This is the brain that receives instructions or inputs and causes things to happen depending on how it is programmed. Remote switches, door contacts or alarm inputs etc. Well, just about anything that is electrically powered! 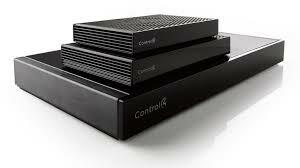 The current line-up of Control4 controllers consists of the EA1, EA3 and EA5. EA stands for Entertainment Automation controller and the number represents the number of concurrent audio streams it can serve. All controllers have a number of control inputs and outputs consisting of relays, contacts and infra-red, the latter being used to control TV’s etc. In addition they all have wired and wireless network connections. Some Control4 devices communicate with their controller using a wireless mesh network called Zigbee. The ‘mesh’ is a system that passes commands from one device to another if there is no direct connection between the device and the controller. This is a really useful feature particularly in large installations. Bespoke firmware called Director runs on the controller. We then use a program called Composer to configure and program the system to do exactly what you want. A very simple installation could consist of an EA1 connected to a TV, surround sound audio video receiver and a satellite receiver. Therefore, with just one button push, the TV, AV receiver and Satellite receiver will turn on in the correct sequence and your favourite channel will appear at the appropriate volume.